Founded by a consortium of Native nations in the Pacific Northwest, ONABEN's mission is to increase self-reliance by promoting the development of tribal-citizen-owned small businesses and the diversification of reservation economies. ONABEN's programs provide financial counseling, business mentoring, links to tribal efforts, referrals to start-up financing, and access to a network of experienced teachers and business people. As the ONABEN network continues to grow, its enormous value to both tribal citizens and its member nations grows as well. "ONABEN: A Native American Business and Entrepreneurial Network." Honoring Nations: 2005 Honoree. 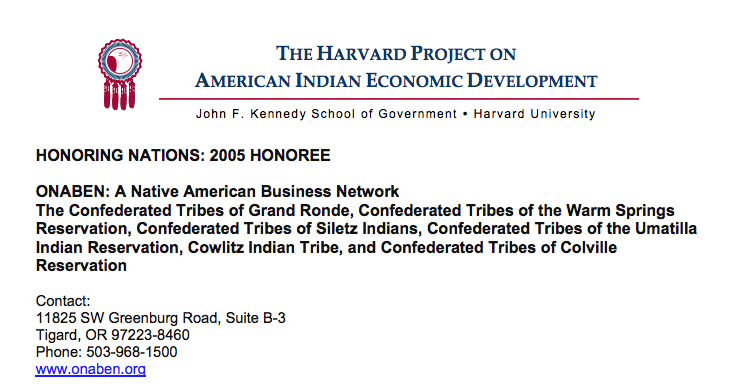 Harvard Project on American Indian Economic Development, John F. Kennedy School of Government, Harvard University. Cambridge, Massachusetts. 2006. Report.